We get it! Your property, whether a second home, primary residence for sale, or investment property, is a large asset in your overall portfolio. Just as you would consider hiring a professional to manage your stocks or other investments, hiring a professional to manage your vacation rental income is an important decision. There are many reasons to consider turning to short term vacation rentals—to broaden market appeal for a home on the market for sale, to offset maintenance and other costs of a second home, or to simply enjoy generating income when your schedule does not allow you to be at your vacation home. You may have already decided that short-term vacation rentals are a solution you want to pursue or are still considering what options are best for you. Carolina Properties specializes in marketing and managing short term vacation rentals! 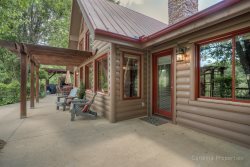 Our focus allows us to boast a 30% - 40% repeat guest rate based on delivering services and experiences not just unique to the Lake Lure, Chimney Rock area, but the vacation rental industry in general. By delivering reliable customer service and quality rentals, Carolina Properties is able to attract more guests to your home while demanding the highest prices. Our guests are comfortable making their vacation investment with Carolina Properties year after year because they can rely upon us to deliver an unforgettable vacation. Carolina Properties can maximize your income production by procuring bookings not only in the prime season but also in the shoulder and off-season, filling last minute vacancies through our members, and investing in off -season and channel marketing. Our proprietary pricing model also ensures that no money is left on the table because we understand the larger booking trends. Vacation rentals are currently the fastest growing segment of the tourism industry and competition has never been fiercer. With a finite vacation season, we recognize that one vacant week can significantly affect your overall return on investment so we never take our eye off the ball. There are many facets to managing a successful rental -- cleaning, property management, maintenance, inspections, advertising, sales, guest services, collecting payments and enforcing the lease agreement—it's a lot to coordinate! As a result, a lot of vacation rental homeowners choose a professional management company to manage their short-term rentals and maximize their return on investment. What Makes Carolina Properties Different? Carolina Properties maximizes your vacation rental income by providing a combination of superior guest services, unparalleled marketing, and proactive property management. All three are key components to procuring the highest yield. Great marketing will go to waste if you cannot deliver a quality product and a perfectly cleaned home will not matter if a guest arrives to a broken air conditioner. We carefully manage your property before, during and after your guest so your hard earned reservation is not in jeopardy by complaints or discounts. Professional Housekeeping - Hospitality housekeeping is very different than just cleaning your home—our housekeepers are professionally trained to have your home fresh and clean, with beds made, towels ready and all the little things in order. Quality Assurance Inspections - All Carolina Properties homes undergo a comprehensive pre-season inspection as well as a pre-arrival inspection to be sure the home is rental-ready. A good first impression is important! Guests of Carolina Properties get one bottom line price for their vacation which includes bed and bath linens, cleaning and all other fees. Carolina Properties offers trip cancellation and accidental damage protection policies to protect your income and your property. Free Starter Amenities such as dish soap, toilet tissue and other products so the guest does not have to scramble to the grocery store upon arrival. Knowledgeable and friendly reservations and guest services staff. 24/7 Property Manager on call for emergencies. With over 90% of vacation rentals found online, your home needs the most exposure to have the most potential for bookings. We are partnered with the largest vacation rental websites for national and global exposure. Paying for comparable exposure to our partner sites can cost you one or two weeks of income per year, however, this benefit is at no additional charge to you and part of our reservation management fee. Carolina Properties makes online browsing easy for your guests—from looking to booking. We provide photography that is as realistic as it is inviting, mapping and real time availability and pricing. We offer online booking and accept most major credit cards, and debit cards. Quick response to inquiries improves results. We are able to respond and process hundreds of inquiries a day within minutes—and around the clock. We are constantly upgrading our use of technology to keep up with the latest trends. Our mobile website is used by over half our guests to obtain information and book right from their smart phones or tablets. Guests can now use our user friendly mobile site with ease. In house marketing for regular e-mail campaigns to past guests, as well as regular promotions and incentives to book with Carolina Properties. Pre-Arrival Inspections to be sure home is rental ready. We check all systems, operations, WI-FI, even light bulbs and remotes to be sure all is in order. Emergency response. As a homeowner, you know that even the best kept home can have an unexpected failure or problem. Carolina Properties has 24/7 property management to respond quickly. Extensive, Reliable Vendor network. When things do go wrong, we have an exclusive team of providers that will respond quickly, be it air conditioning, pool, appliances or other items. Most guests understand when things go wrong, but want it fixed quickly. Carolina Properties uses the leverage of our portfolio to negotiate a quick response to homes with guests in property. We are gathering information so both guests and your property care team have a comprehensive binder detailing your homes systems, cleaning preferences, and specific items. We are managing homes, not "units" and we want to deliver custom care to our owners and guests.